2014 (January to September): Volkswagen remained the top-selling carmaker in Germany followed by Mercedes, Audi and BMW with the VW Golf the most popular car model. 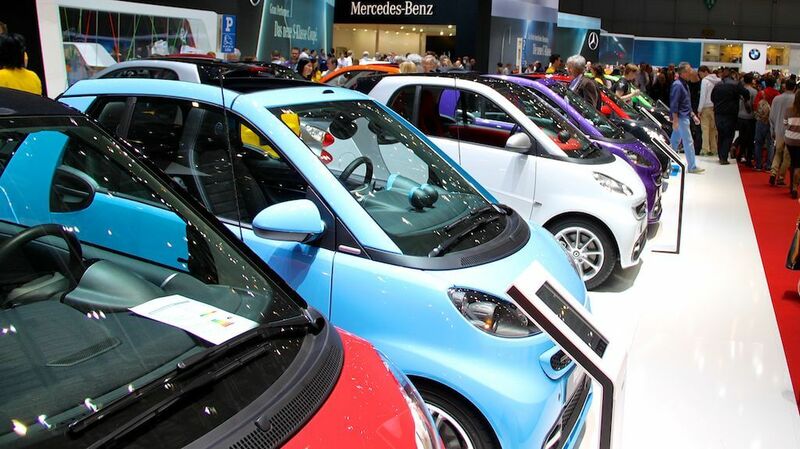 New passenger vehicle registrations in Germany increased by 3.2% during the first three quarters of 2014. Skoda and Renault were the most popular imported car marques. New passenger vehicle (PKW) registrations in Germany increased by 3.2% during the first three quarters of 2014 to 2,281,671 cars. This compared to only 2,217,019 cars in 2013 – one of the worst years for car sales in Germany on record – but less than the 2,358,798 cars registered during the first nine months of 2012. Total new vehicle registrations in Germany from January to September 2014 increased by 3.4% to 2,684,310 vehicles – including cars, motorbikes, buses, and heavy goods delivery vehicles. According to the VDA, automobile production in Germany increased during the first nine months of 2014 by 4% to 4,246,400 cars of which 3,263,400 (+4%) were exported. There were hardly any changes in the rank order of the different car manufacturers in Germany during the first three quarters of 2014 compared with a year ago. Volkswagen easily remained the best-selling car brand in Germany with more than a fifth of the market. VW narrowly outperformed the market. Volkswagen sold more cars than second-placed Mercedes Benz and third-placed Audi combined. Mercedes Benz sales were down (-4%) while Audi sales growth was in line with the broader market and BMW sales below market average. Behind these so-called premium brands, Opel and Ford both saw solid growth. However, the most improved top-ten brands were VW-owned Skoda and VW-owned Seat – both with double-digit growth. Skoda maintained its position as Germany’s favorite imported car. Renault swapped positions with Hyundai – the only position change amongst the top-10 brands – to regain its position as the best-selling non-VW-owned imported car brand in Germany. Hyundai’s sister brand Kia saw sales down 5% and slipping to 16th from 12th. Worst performing brand was Chevrolet (down 74%), which is withdrawing from the European market. Of the larger brands – Smart (-23%) and Mini (-8%) were the worst performers. Both brands relied heavily on single models – the Mini has been selling well since a new model launch earlier in 2014 and the new Smart should be at the dealers during the final quarter of 2014. Note: X indicates a change in methodology making the calculation impossible, e.g. from 2014 the Golf and Jetta are calculated as separate models. The VW Golf was, as ever, the most popular car in Germany. Golf sales increased by around 6.5% – only 727 Jettas were registered in Germany during the past nine months, so they hardly affect the statistics, which listed the two models together until the start of this year. The Golf always is the best-selling car model in Germany so the more interesting question is what model ends up second. Currently, the VW Passat is the second best-selling car model. A model change at the end of the year may influence sales figures. The Passat Variant is hugely popular with German families but as second-hand car – the high percentage of business registrations confirms that the car is simply to pricey for private buyers. The BMW 3 Series was the biggest looser amongst the top-ten best-selling car models in Germany during the first nine months of 2014. The BMW also has a very high percentage of business buyers – 10% more than the competing Audi A3 and 20% more than the Mercedes Benz C-Class. Mercedes Benz cars generally have a higher percentage of private buyers compared to the competition from BMW and Audi. The Skoda Octavia was the most-improved model and also the most popular imported car in Germany but helped by VW ownership. The only other imported car model was the Seat Leon, also part of the VW Group. Sales of the Ford Focus also improved strongly, as did the Opel Corsa, which is due for a model change by the end of the year.